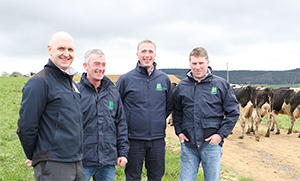 The Irish Grassland Association Dairy Summer Tour focuses on milk production on leased land when it visits two grass based dairy farms in Kilkenny and Grange, Carlow. The event, sponsored by AIB Bank, takes place on Tuesday July 25th at 8am sharp. The major focus of this year’s event will be on producing milk on a part leased or fully leased milking platform. Maximising the use of grazed grass in the cows’ diet will feature prominently on both farms. The Irish grassland Association Sheep Conference and Farm Walk kindly sponsored by Mullinahone Co-Op and MSD Animal Health takes place on the 11th May at 9.30 a.m. in the Bloomfield House Hotel in Mullingar. The conference will take place in the morning followed by a farm walk on the farm of John Bell Castletowngeoghan, Co. Westmeath. The winter of 2012/13 has clearly highlighted the importance of silage feed quality. The poor harvesting conditions during 2012 and rising concentrate prices has clearly shown that good quality grass silage is very valuable on farm. This year’s Irish Grassland Association Beef Conference and Farm Walk “Healthy Soils, Healthy Cattle, Healthy Profit” sponsored by Dawn meats and Interchem will take place on Tuesday 18th of June. Reseeding is a key component to increasing meat and milk production from grazed grass. The run up to this year’s Irish Grassland Association Sheep Conference and Farm Walk saw the topic of weather frequently enter planning discussions. The Irish Grassland Dairy Summer Tour sponsored by AIB went to West Cork on 26th July.